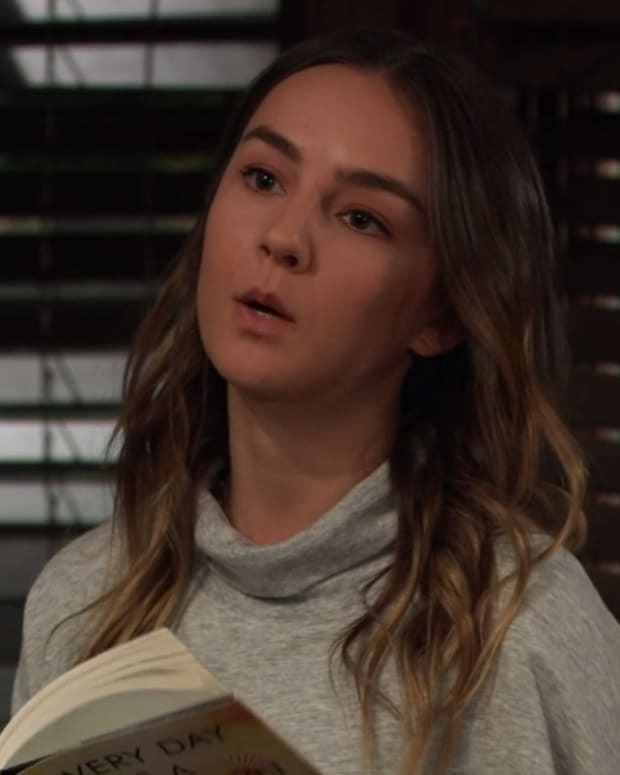 Perkie's Observations: Is Kristina's Professor Male or Female on General Hospital? Jason explains the memory he&apos;s having. He can feel the emotions of the moment. Sam takes him to the rooftop where it occured. Jason wants to explore those memories. Sam feels he needs to do it on his own, since she can&apos;t be objective. Nikolas tells Hayden both he and Spencer care about her. He wants to spend his life with her. Hayden eventually agrees to his proposal. Julian wants to get married soon, before Alexis gets preoccupied with her law suit against the city. Julian wants to get married at city hall. Alexis decides she wants the church wedding she&apos;s never had. Kristina interrupts a private moment between Molly and TJ and snarks out her sister. Kristina is upset because Sam questioned her after a talk with Molly. She worries their mother will find out what happened at school. Jordan is annoyed when she finds Curtis at the Metro Court. She demands to know why he hasn&apos;t left town. TJ runs into them and is thrilled to see his uncle in town. Curtis apologizes for not being there when TJ&apos;s father died. TJ understands. Tracy is upset to find Larry Ashton in the room beside her. He claims he&apos;s a changed man and wants to have fun. Laura walks in on Nikolas and Hayden. She pretends to be happy about their news. When Hayden leaves the room, Laura questions if Nikolas is marrying Hayden out of guilt for having her shot. Nikolas claims he loves Hayden and says she&apos;s been honest with him. Alexis tells her girls about the wedding plans. She asks if they&apos;re willing to be part of the ceremony. Molly and Kristina both agree to be maids of honor. Hayden calls Tracy to let her know she and Nikolas are getting married. Tracy is thrilled she&apos;ll be getting her company back. She tells Larry to take a hike. Hayden tells Nikolas she wants to get married right away. Jordan warns Curtis not to hurt TJ, or tell him the truth. Kristina gets a call from Parker. She warns him/her that if he/she doesn&apos;t stop bothering her, Kris will spill the beans to his/her wife. Jason says he wants to recover his memories and get his old self back, even if it means hypnosis.